Reigning ONE Bantamweight World Champion Kevin “The Silencer” Belingon was named the ONE Championship 2018 Warrior of the Year after putting together a campaign that saw him skyrocket to the top of the bantamweight division with a pair of world championship wins. The Team Lakay star began 2018 by once again proving himself to be the number one contender in the bantamweight division with a dominant TKO win over Andrew Leone at ONE: HEROES OF HONOR in Manila back in April. Belingon outclassed the American former world title contender and finished him off with a well-timed spinning back kick to the body followed by a barrage of knees, all in just one round. 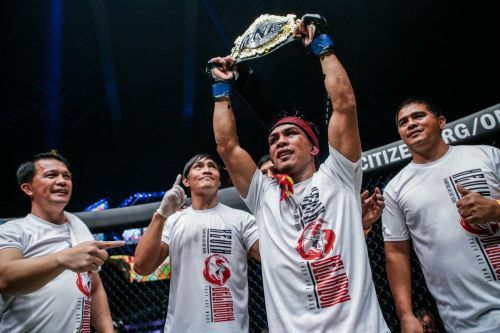 The spectacular victory earned Belingon a shot at his first world championship after being matched up with two-division world champion Martin Nguyen for the ONE Interim Bantamweight World Championship at ONE: REIGN OF KINGS in Manila last July. Belingon cemented his place as the top contender to Bibiano “The Flash” Fernandes’ ONE Bantamweight World Championship with a clear-cut unanimous decision win over Nguyen to claim the ONE Interim Bantamweight World Championship and set up a highly-anticipated rematch with the Brazilian star. At ONE: HEART OF THE LION last November, Belingon gained retribution for his 2016 loss to Fernandes with a split decision win to dethrone the long-time champion and become the undisputed ONE Bantamweight World Champion. Belingon used his much-improved grappling to hold his own against Fernandes, while out-striking the former champion for five rounds. The Filipino star became the first man in ONE Championship to hand Fernandes defeat, putting an end to the Brazilian’s undefeated streak that dated back to 2011, which included a five-year reign as ONE Bantamweight World Champion. Belingon’s year of dominance was enough for him to be hailed as Warrior of the Year, over other stars such as Aung La N Sang, Xiong Jing Nan, Shinya Aoki, and Team Lakay teammate Folayang.